I got back to work on this portrait today. 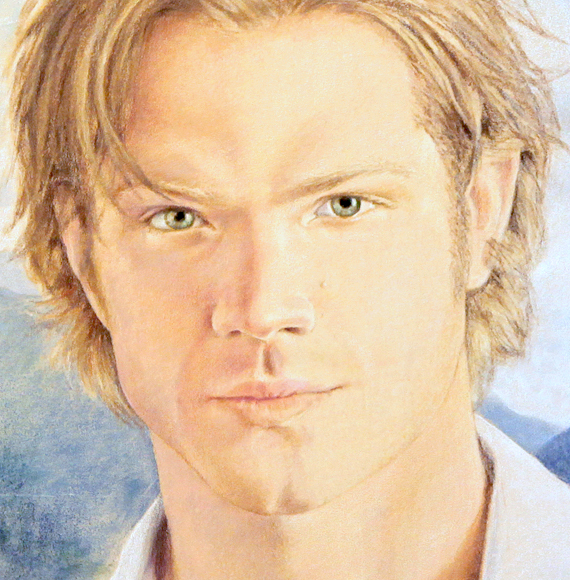 It was kind of hard to remember which colors I had been using for Sam's face, but I think I found the correct ones. Now I'm trying to be more organized in keeping track of which colors and pencils I use for different pieces. I've been jotting down the pencil brand and color in a little notebook as I go. Surely this will be helpful since I have more than one portrait project going at the same time. Before starting back on this one I decided to make a change I've been thinking about. Namely Dean's shirt, I never did like the shirt in the reference photo. It was too detailed. I wanted a plainer look, so I had my husband pose for a few reference pictures for me in one of his dark shirts. With this in hand I was able to sketch in a new look for the shirt and have it on hand later to render the shirt realistically. The paper is a 20x28 inch sheet of Fisher 400. This is the first time I've worked on a real sanded paper surface with colored pencils and it has been a different enough experience to put me off for a while. But now that I'm back with a fresh eye and renewed enthusiasm, I think I will ultimately end up loving this paper. My problem I think has always been my timidity in laying down color. I tend to get too focused in small areas. With a work surface this size and this texture you have to step back and lay color down in bolder strokes than I'm normally used to. 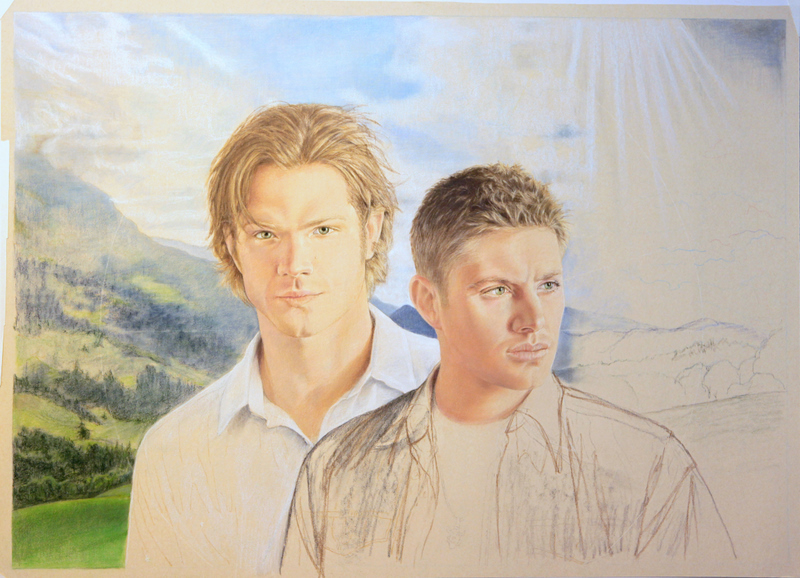 This is what I mostly worked on, Sam's face. With more color on the paper, I was able to get better results using a brush to smooth the colors together. I'll have to really try to remember to be bolder in applying my colors. Awesome portrait work! Look forward to seeing more.